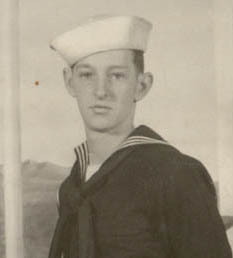 Corbett Boggs, Jr. entered the U.S. Navy in March 1945 and received his basic training at Great Lakes, Illinois serving Company 305. After basic training he was stationed on the USS West Virginia boarding her with the new recruits in the Philippines, July 1945. He served as Seaman Second Class U.S.N.R. Division 11 until he was transferred to the USS Waldron, September 11, 1945. His best friend while on board was Bill Branham. Both he and Bill were from Dickenson County, VA. While on the USS West Virginia, he was afforded the opportunity to visit his older brother's gravesite, who had been killed during the siege of Okinawa, April 28, 1945. Excerpt from a letter to Corbett's mother written 1945. "No Mom, I never did get the pen and candy you sent me. This pen I have now is one I bought on the West Virginia. It writes pretty good for what it cost, just set me back a buck so it isn't so bad. While I was on the West Virginia they got a bunch of mail, it all got wet on the way to the ship and they couldn't tell who it was to, so they threw it over the side of the ship. It may have been in that bunch."